Evangelist Bailey Smith (1939-2019) preaches during a chapel service at Southwestern Baptist Theological Seminary in Fort Worth, Texas, in 2005. Smith, 79, died at his home in Duluth, Ga., on Jan. 14. 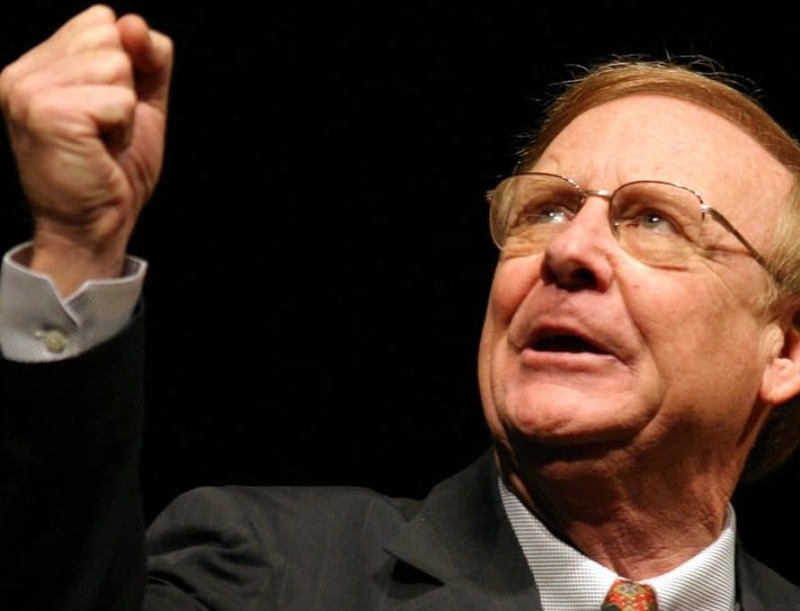 DULUTH, Ga. (BP) – Evangelist Bailey Smith, who helped sustain the Conservative Resurgence at its outset in the Southern Baptist Convention, died Monday morning (Jan. 14) at his home in Duluth, Ga. He was 79. J. Gerald Harris, retired editor of Georgia Baptists’ Christian Index newsjournal, described Smith as “a powerful preacher, devoted pastor and faithful friend” in an obituary posted Jan. 15 at the Index’s online news site. Smith’s two terms as SBC president (1980-1982) were marked by his resolute preaching of the Gospel. At one point, he sparked a national controversy over his declaration that “God Almighty does not hear the prayer of a Jew.” The comments, spoken at an evangelical gathering in Dallas that included remarks by Republican presidential nominee Ronald Reagan, subsequently were clarified by Smith and others that he was speaking from a theological, not racial, standpoint. Smith led churches in Texas, Arkansas and New Mexico before being called, at age 34, as pastor of First Southern Baptist Church in Del City, Okla., where he served 12 years. At the time of his election as SBC president, Smith was the youngest man ever to lead the convention, Harris wrote, noting that he earlier had served as president of the Southern Baptist Convention Pastors’ Conference and the Baptist General Convention of Oklahoma simultaneously. “In 1980 the Del City church baptized 2,000 persons, an accomplishment unprecedented in Christian history,” Harris wrote. “In the 12 years Smith was the pastor … the membership grew from 6,600 to more than 20,000, and in a convention that was known for thriving on growth and soul-winning, Bailey Smith was known as a pacesetter. “In 1985 the Del City church was flourishing, but Smith sensed a definite call from God to become a vocational evangelist,” Harris continued. “He is the only former president of the Southern Baptist Convention to enter crusade evangelism.” Bailey Smith Ministries conducted area-wide crusades, church revivals, Bible conferences, ladies’ retreats and overseas ministries. Smith’s Real Evangelism Conferences “touched and changed countless lives for three decades,” Harris wrote. First Baptist Church in Woodstock, Ga., led by Johnny Hunt hosted one of Smith’s conferences. Smith authored several books, including “Real Evangelism,” “Taking Back the Gospel,” “Real Christianity,” “Real Christian Excellence” and “The Grace Escape.” Harris wrote that Smith was working on his autobiography at the time of his death.